Paying attention. Paying attention. With the English vocabulary being so vast, why a monetary allusion in this well-known idiom? My guess is it’s because attention, like money, is finite. There’s only so much you have at a given moment. You can spend it here or there, but not everywhere to an unlimited degree (and there’s no borrowing or credit when it comes to attention). And that’s why the wise are careful about where they pay their attention. The craft of magic (and politics) is based on subtly inducing you to put your attention in the wrong spot while the mechanics of the trick happen outside your focus. And voila! 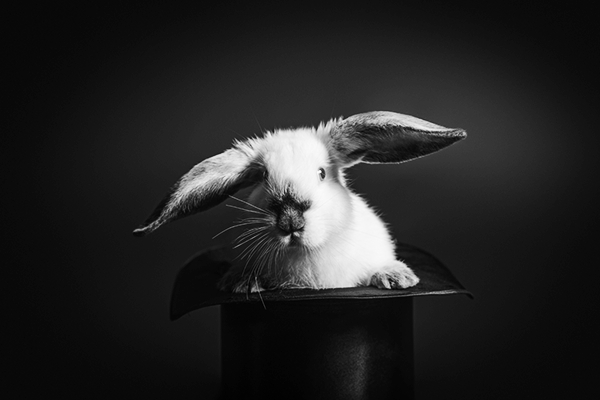 Rabbit out of a hat. But the real trick is this: attention can’t be stolen – it still has to be given. And we do give it. Every day. And sometimes simply out of habit. So then, the question becomes this: are we paying attention to what we’re paying attention to? Pay is historically a synonym for give. Good point, Jordan, though even if we substitute ‘give’, I think it’s implicit that we’re giving from a limited resource, thus need to be wise and discerning about who and what we give to.